Paxiom offers the most personalized buying experience ever. Our customers can try out our vacuum packaging machine solutions with any of their products to test the compatibility. We have a wide variety of technologies including weigh filling, bagging, wrapping, auxiliary and corrugate. Also, end of line automation and conveying that cater to edible and non-edible products. For the first vacuum packaging machine, we have our Bingo Bagger, one of the product lines of our horizontal bagging machine for pre-made wicketed bags. The Bingo Bagger is designed to blow open the bag and once open, clamp down on the backside of the pouch. After the bag is clamped down, an auxiliary filler machine will now fill the bag. Lastly, the filled bag will be taken over by the finger mechanism that will insert into the bag, hold it tight, and automatically tear if off the wicket pins and transfer it to the bag sealer for the finishing touches. The one distinct characteristic of the Bingo Bagger from other horizontal bagging machines is that it can be upgraded for vacuum packaging. The Bingo Bagger vacuum packaging machine is designed to fill larger bags or pouches. Ability to vacuum or gas flush, hence, providing a consistent nitrogen residual into the bag. It can fill both laminated and low-density polyethylene materials. 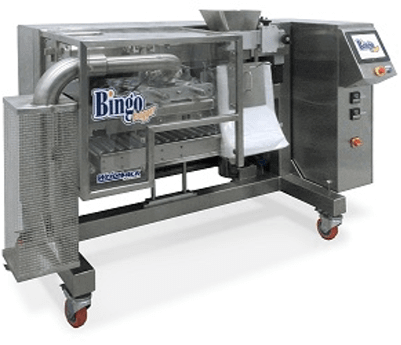 The Bingo Bagger is considered to be the most versatile vacuum packaging machine on the market. This vacuum packaging machine is also capable of running 20lbs of product. It’s ideal for various production needs like food service, multipacks, institutional, and bulk production. You also have the option to fill the products manually or automated filling machine in addition to the Bingo Bagger. Its standard features include auto bag width adjustment, no bag-no fill sensing logic, trim cut and wastebasket, fully adjustable dwell time, speed, and bag change-over. Finally, we have the R2B Horizontal Form Fill & Seal bagging machine. Apart from its vacuum station upgrade—which makes it a vacuum packaging machine—, it also has other options like gas flush, hole punch, middle capping device, shaped bag molding device, stand-up pouch former, tare notch, and zipper application device. This vacuum packaging machine makes, fills, and seals pouches in one automatic process. It uses laminated roll stock film to make a large variety of pouch styles. This eliminates the need for pre-made bags, thus, effectively reduces material cost. The R2B features a smart-engineered electronics that ensures an accurate control of the machine during set up and running production. It is built for easy setup and cleaning. This is due to its large removable access panels in both the front and back. Straight-flow design that allows the operator to see the sealing process and conveniently access the parts. Using flat roll stock film, the R2B produces a variety of bag styles. Such as 3-sided seal, 4-sided seal, and doy style stand-up pouches (with or without a zipper enclosure). Its standard features include servo-driven, color touchscreen, adjustable bag width and length. Also, easy access drive mechanisms, stainless steel exterior frame, festo valves, and more.